the poor bear’s head. ALL over. credit card in the checkout line. gypsies her way around L.A.
tiny bear on his lap, waiting for her. When I miss Riley most, I find Ted. Sit on the bed, hug him, and smilecry. ‘what is it about bears that is sooo appealing? Loved this and the smilecry got me big! I hope he didn’t turn out like Ted in the movie! 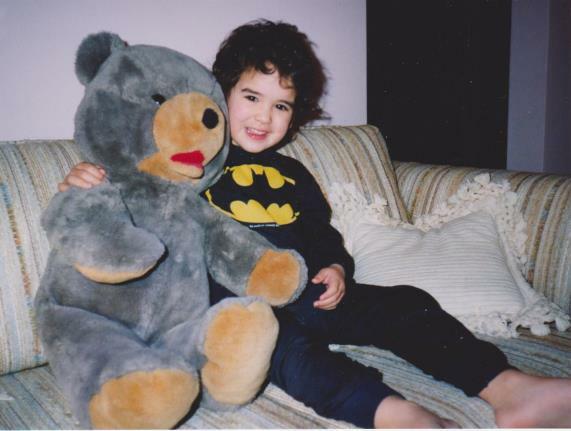 my sister bought me a bear almost that big…only 15 years ago!. Mr. Applause – he’s in our guest bed right now. He’s a truly awesome Bear! I loved “smilecry”. I think we’ve all done that. LOL! You just have to admire the girl’s technique! I so love this – all of it, the photo, the little girl happy-smile, the story and you sitting there, missing her, hugging the bear. Adorable. Riley baptized that bear in her snot..
smart little girl ya got there.. This is adorable. I bought my daughter a bear when she was seven, she named Margaret and she is still so loved even nine years later. ha its funny…my sister was similar…she had to have this baby doll that was bigger than her…they had gotten one for christmas but it was not bigger than her so my dad went out and found one…cheap…on christmas day…taller than her…and for years it was her constant companion…. nice batman shirt as well…smiles. what a great memory though! Sounds like Riley has had a mind of her own and is determined to get what she wants, whatever that requires. I loved this story and I can well relate to how Ted is filling in as a daughter surrogate until she returns to claim him. De-fricking-lightful! You couldn’t make this stuff up! Such a great telling of the sticky situation. And now, all these years later, you have Ted. I suppose it was fate, kismet, meant to be.